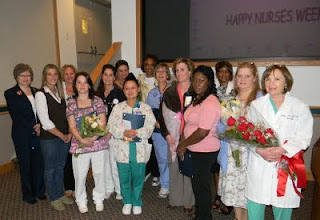 Bridgeport Hospital celebrated Nurses Week May 6–12 with a series of activities that included awards ceremonies, complimentary chair massages, distribution of gifts, a presentation on how nursing impacts patients and caregivers in cancer care, and a community cleanup project at Seaside Park. "We have a tremendous nursing staff," said Senior Vice President, Patient Care Operations MaryEllen Kosturko. "I am proud and honored to lead this team." Hope Juckel-Regan of Old Lyme was recognized at the ceremony for her 19 years of leadership and support, first as Bridgeport Hospital's Senior Vice President, Patient Care Services and then as Executive Vice President and Chief Operating Officer. Juckel-Regan announced that she will retire this summer. Michele DiLella was also one of 11 Bridgeport Hospital nurses who received regional Florence Nightingale Awards for nursing excellence at a Stamford reception on May 5. The hospital's other Nightingale Award winners are Karen Anderson of Stratford, Labor & Delivery; Claire Chianese of New Fairfield, Psychiatry; Elizabeth Foden of Trumbull, P.T. Barnum Pediatric Center; Russell Hullstrung of Beacon Falls, Organization Development & Education; Carol Knee of Stratford, Ahlbin Centers Inpatient Rehabilitation Unit; Georgia Patnode of Prospect, Internal Medicine; Stacey Peace of West Haven, Resource Support Unit; Gini Neglia of Milford, Cardiovascular Services; Yvonne Wilkins of Trumbull, P.T. Barnum Pediatric Center; and Vanessa Winder of Westport, Resource Support Unit. In photo: Bridgeport Hospital Nurses Week award recipients (L-R) Michele DiLella, Daniela Marcoccia, Marsha Telesha, Brooke Barbee, Karen Hellthaler, Hope Juckel-Regan, Carmen Ayala, Renée Moyé, Jan O'Neil, Terri Nelson, Claudette Thyme, Alice Bennett, Jancee Pust-Marcone and Mary McNiff. Not pictured: Susana Araujo. Editor's note: All information in this post was contributed. It is unedited here and posted as a public service.